In this study we analyzed the genome sequence of R. elongatum DSM 19469T. We present a description of the genome sequencing and annotation and a summary classification together with a set of features for strain DSM 19469T, including novel aspects of its phenotype. 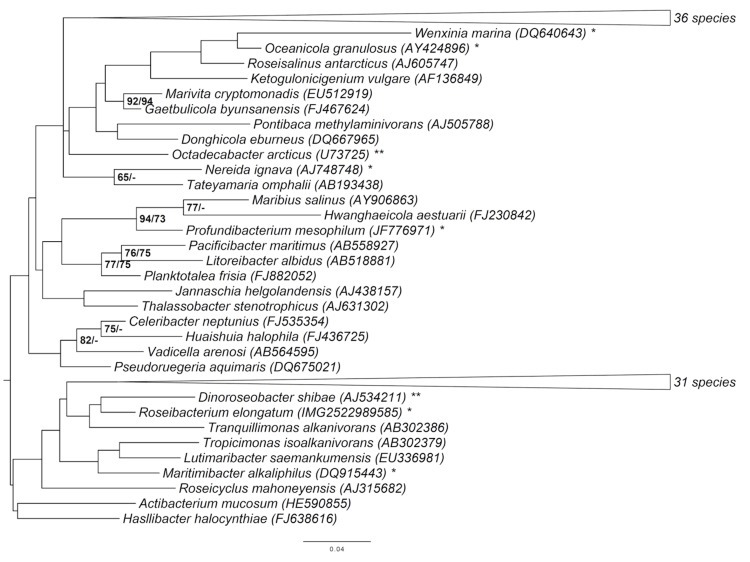 Phylogenetic tree highlighting the position of R. elongatum relative to the type strains of the type species of the other genera within the family Rhodobacteraceae. The tree was inferred from 1,331 aligned characters of the 16S rRNA gene sequence under the maximum likelihood (ML) criterion as previously described . Rooting was done initially using the midpoint method  and then checked for its agreement with the current classification (Table 1). The branches are scaled in terms of the expected number of substitutions per site. Numbers adjacent to the branches are support values from 600 ML bootstrap replicates (left) and from 1,000 maximum-parsimony bootstrap replicates (right) if larger than 60% . Lineages with type strain genome sequencing projects registered in GOLD  are labeled with one asterisk, those also listed as 'Complete and Published' with two asterisks [8-11]. A representative genomic 16S rRNA gene sequence of R. elongatum DSM 19469T was compared with the Greengenes database  for determining the weighted relative frequencies of taxa and (truncated ) keywords as previously described . The most frequently occurring genera were Rhodovulum (35.1%), Jannaschia (13.5%), Dinoroseobacter (10.6%), Rhodobacter (9.6%) and Roseobacter (8.5%) (89 hits in total). Regarding the two hits to sequences from members of the species, the average identity within HSPs was 100.0%, whereas the average coverage by HSPs was 99.7%. Among all other species, the one yielding the highest score was Dinoroseobacter shibae (NC_009952), which corresponded to an identity of 95.7% and a HSP coverage of 100.1%. (Note that the Greengenes database uses the INSDC (= EMBL/NCBI/DDBJ) annotation, which is not an authoritative source for nomenclature or classification). The highest-scoring environmental sequence was AF513932 (Greengenes short name 'Rhodobacter group clone LA4-B3'), which showed an identity of 99.4% and a HSP coverage of 99.9%. The most frequently occurring keywords within the labels of all environmental samples that yielded hits were 'microbi' (4.3%), 'mat' (2.3%), 'sea' (2.0%), 'marin' (2.0%) and 'coral' (1.9%) (157 hits in total). The most frequently occurring keywords within the labels of those environmental samples that yielded hits of a higher score than the highest scoring species were 'group, rhodobact' (33.8%) and 'rhodobacteracea' (32.4%) (2 hits in total). These keywords fit well to the known ecology (and phylogenetic relationships) of R. elongatum DSM 19469T. Cells of strain OCh 323T are Gram-negative, non-motile and rod-shaped, 1.6-10.0 µm in length and 0.5-0.8 µm in width (Figure 2). Colonies are circular, smooth, convex and glistening, opaque and pink-pigmented. Optimum growth occurs at a temperature of 27-30°C and a pH of 7.5-8.0. Cells can grow in the presence of 0.5-7.5% NaCl but do not grow in the absence of NaCl. Cells are positive for urease activity but do not show nitrate reductase or phosphate activities. They are negative in the Voges-Prosgauer test but the ONPG reaction is positive. Cells do not produce indole or H2S. Gelatin is hydrolyzed, but alginate, starch and Tween80 are not. Cells do not utilize acetate, citrate, D-glucose, DL-malate, ethanol, pyruvate, succinate. Acid is not produced from D-fructose, D-glucose or lactose (all data from ). In this study the utilization of carbon compounds by R. elongatum DSM 19469T grown at 28°C was also determined using Generation-III microplates in an OmniLog phenotyping device (BIOLOG Inc., Hayward, CA, USA). The microplates were inoculated with a cell suspension at a cell density of 95-96% turbidity and dye IF-A. Further additives were vitamin, micronutrient and sea-salt solutions, which had to be added for dealing with such marine bacteria . The plates were sealed with parafilm to avoid a loss of fluid. The measurement data were exported and further analyzed with the opm package for R [7,25], using its functionality for statistically estimating parameters from the respiration curves such as the maximum height, and automatically translating these values into negative, ambiguous, and positive reactions. 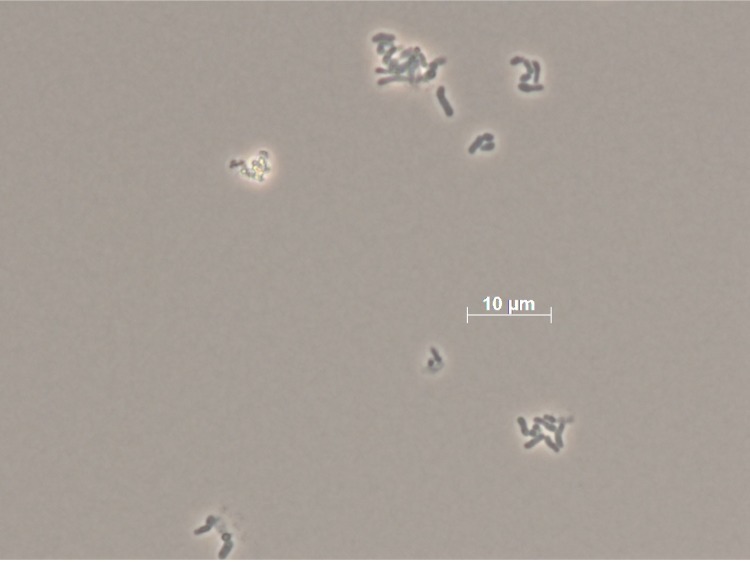 A culture of strain DSM 19469T was grown aerobically in DSMZ medium 514  at 28°C. Genomic DNA was isolated using Jetflex Genomic DNA Purification Kit (GENOMED 600100) following the standard protocol provided by the manufacturer but modified by an incubation time of 60 min, incubation on ice over night on a shaker, the use of additional 50 μl proteinase K, and the addition of 100 μl protein precipitation buffer. DNA is available from the DSMZ through the DNA Network . 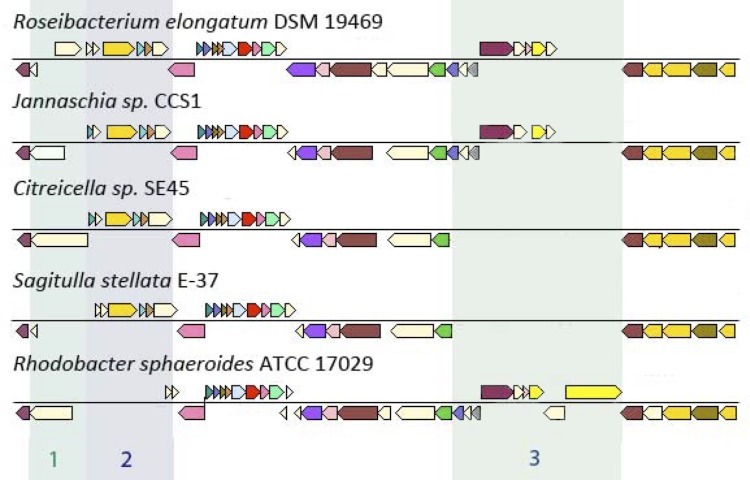 The fraction of shared genes between strain R. elongatum DSM 19469T and the neighboring strains D. shibae DFL-12 (DSM 16493T) [11,48] (Figure 1) and Jannaschia sp. 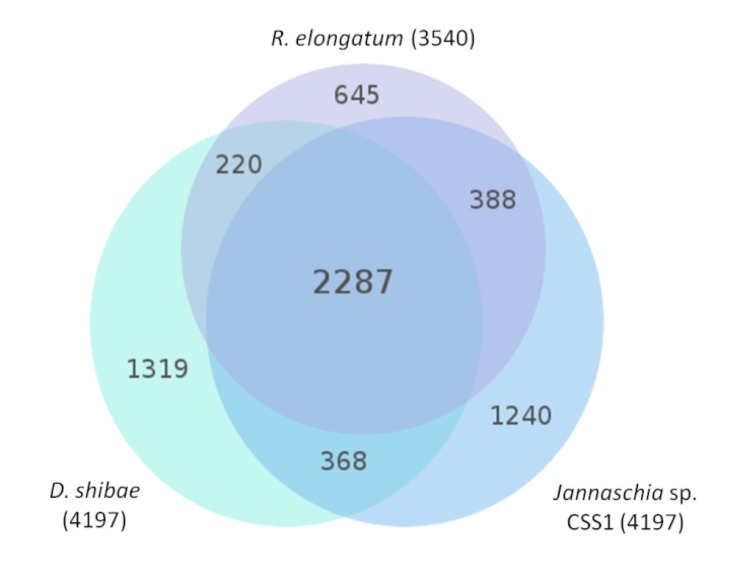 CSS1 (which turned out to have similar genomic characteristics in the course of this study, too), both members of the Roseobacter group are shown in a Venn diagram (Figure 4). The number of pairwise genes was inferred from the phylogenetic profiler of the IMG-ER platform . Homologous genes were detected with an E-value cutoff of 10-5 and a minimum identity of 30%. Phages are widely distributed and common in marine environments [49-51]. Horizontal gene transfer of the phage genome and its integration in the host genome are known to drive the bacterial diversity [51,52]. In the genome sequence of R. elongatum DSM 19469T several putative phage-associated gene sequences were detected, particularly organized in gene clusters (e.g., roselon_02355 - 02370). Quorum sensing (QS) is a cell-to-cell communication system, where bacteria interact with each other in dependence of their population density. Gram-negative bacteria use small signal molecules called autoinducers, which are produced, excreted through the bacterial membrane and detected by conspecific bacteria. Consequently, when the concentration of those membrane-diffusible autoinducers reaches a specific threshold value, the population responds with an activation of gene expression to coordinate a population-wide behavior [53-58]. QS was first detected in the marine gammaproteobacterium Vibrio fischerii, a species often found to live in symbiosis with squids or fishes. Here, the autoinducer accumulation and the activation of certain genes result in biolumescence [59,60]. Other examples for QS-induced bacterial physiological aspects are biofilm formation, exopolysaccharide production and virulence [53,61]. Interestingly, many representatives of the Roseobacter group were shown to encode and/or express gene sequences associated with QS [e.g., 62-65]. Light is used as energy source by many bacteria in the ocean. An increasing number of representatives belonging to the Roseobacter group have been found to be aerobic anoxygenic photoheterotrophs, containing bacteriochlorophyll a (Bchl a) [3,4,66-69]. They transform light energy into a proton motive force (pmf) across the membrane that is used for the generation of ATP, which could have an importance for marine environments and global cycles [66-68]. Aerobic anoxygenic photoheterotrophs represent a significant fraction of the microbial population depending on the location [69-73]. It was further shown that aerobic anoxygenic photoheterotrophs synthesize Bchl a only in the presence of oxygen [66,74] and that the photosynthetic pigments of aerobic alphaproteobacteria are synthesized under dark conditions [75-77], whereas some members of the gammaproteobacterial OM60/NOR5 clade also synthesize pigments in the light . Furthermore, Elsen and colleagues reported that genes encoding the photosynthetic apparatus and related genes are mainly organized in a large gene cluster . The genome sequence of strain R. elongatum DSM 19469T encodes a functional photosynthetic gene cluster (roselon_01064 - 01096) containing a set of bch genes, puf genes, crt genes, hem genes and genes for proteins with sensory activity (Figure 5). Strain R. elongatum DSM 19469T was originally described as non-flagellated . In the genome a flagella gene cluster was found flanking the chromosome-partitioning gene dnaA (roselon_1273). Flagella formation depends on external stimuli such as incubation temperature or composition of the media . Thus, strain DSM 19469T might exhibit a motile phenotype under certain, as yet unknown, conditions. Flagellar genes of strain DSM 19469T involved in flagellar assembly and function were analyzed to assess potential motility behavior. The cluster consists of 28 genes (roselon_01279 - 01316). Three further motor switch proteins, including fliG were detected upstream of roselon_03222. Together with fliM (roselon_03295) and fliN (roselon_01309) fliG forms a protein that controls rotation behavior of flagella. This dissociation of flagellar operons has been seen in two groups of alphaproteobacteria . No master regulator genes operon (flhDC)  could be detected. Whereas genes controlling the early flagellum assembly were not detected, several proteins necessary for the formation of the basal body were found, including flgDEFGHIKL and fliF. Genome analysis of strain DSM 19469T revealed further the presence of genes involved in the formation of the export apparatus: the previously mentioned C-ring forming complex fliGMN and the protein-encoding sequences flhA, flhB, fliP, fliQ and fliR, which are involved in pore-forming through the membrane . Whereas two motor protein-encoding gene sequences motAB were found (roselon_01316, roselon_01313), a homolog of the fliO gene as part of the channel-forming apparatus was absent. Additionally, the genome of strain R. elongatum DSM 19469T revealed the presence of regulatory genes controlling the late phase, such as the hook capping protein (roselon_01279), the flagellar hook-length control protein (roselon_01280) and the flagellin-encoding gene sequence fliC (roselon_01284). Methyl-accepting chemotaxis proteins that sense external stimuli, and therefore direct flagella-induced motility of strain DSM 19469T, could not be detected. To compare the flagellar gene clusters of neighboring species (Figure 6), homologs of flgG coding for a protein mainly involved in the formation of the basal body in R. sphaeroides ATCC 17029  were identified using the IMG/ER platform . All compared genomes show a similar gene cluster structure, but have variations such as differences in gene length for fliK, which controls the completion of previous flagellum-assembly steps. The fliK protein in R. sphaeroides is 700 amino-acid residues (AA) in length . A genome BLAST search (minimal similarity 30%, maximal e-value 10-5) against putative fliK proteins revealed that the gene-encoding sequence length of fliK varies from 102 AA in R. sphaeroides strains WS8N and 2.4.1 to 937 AA in Citreicella sp. SE45. The genomes of the three species Salipiger mucosus, Sagittulla stellata and Pelagibaca bermudensis each encode a truncated fliK-encoding gene sequence, but those strains do not form flagella [86-88]. These truncations could be the reason for inactive proteins resulting in a non-motile phenotype. In contrast, the genome of Jannaschia sp. CCS1 codes for a fliK protein of 612 AA (Jann_4206) and, interestingly, this strain was reported to be motile. The genome sequence of strain R. elongatum DSM 19469T was found to have specific genes associated with the putative biosynthesis and export of exopolysaccharides (roselon_01150, roselon_01343 - 01343) and the putative export of capsule polysaccharides (e.g., roselon_00513, roselon_01783 - 01785). Additionally, the genome of strain R. elongatum DSM 19469T encodes several gene sequences associated with flp-type pili biogenesis and formation (e.g., roselon_01843 - 01852). Hence, the formed pili might play a role in adhesion or switching-type motility on solid surfaces. Further, strain R. elongatum DSM 19469T seems to accumulate polyhydroxyalkanoates as storage compounds (e.g., roselon_00211 - 00214). The genome sequence of strain R. elongatum DSM 19469T encodes a gene cluster associated with a Sox multienzyme complex (roselon_02191 - 02202) that could be utilized for the oxidation of thiosulfate to sulfate. Carbon monoxide could be putatively oxidized by aerobic-type carbon monoxide dehydrogenases (roselon_01738, roselon_01976 - 01977, roselon_02472, roselon_02474). Several genes play a role in the electron transport chain, such as those associated with the NADH dehydrogenase (e.g., roselon_00011 - 00023), succinate dehydrogenase (roselon_01681 - 01684) and cytochrome bd ubiquinol oxidase (roselon_00027 - 00028). In addition two different cytochrome c oxidases (caa3-type [e.g. roselon_02733 - 02734] or cbb3-type [roselon_00626 - 00628]) were detected. Riedel T, Fiebig A, Spring S, Petersen J, Göker M and Klenk HP. 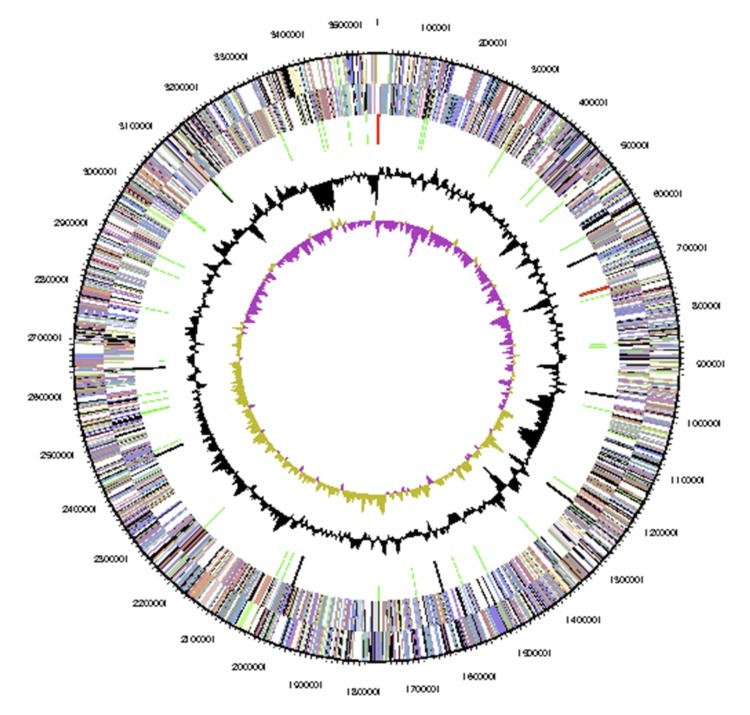 Genome sequence of the Wenxinia marina type strain (DSM 24838T), a representative of the Roseobacter clade isolated from oilfield sediments. Stand Genomic Sci. . Anonymous. PILER Genomic repeat analysis software. 2009.